I want to rank my website for keyword "paste"
Discussion in 'White Hat SEO' started by jovica888, Jul 15, 2015. I think I will get some good backlinks in the future... I made meta tags almost 100% matching with my content... Internal linking is good. What should I do more? Yeah you have to use more specific keywords. Ranking for paste is near impossible and even ranking short term using some of the lesser-known methods will not last and will ultimately get your site pummeled by Google. I also want to rank one of my websites for "loans". Hope I can achieve it. Jokes apart, it might be possible to rank in paste but that would take ages as the higher the competition the higher is the filtration and manual checks. My advise would be to try paste but add a large list of related keywords which are easier to rank. Maybe you would rank the other keywords soon. Then if the rest works, you might finally go for the kill in the few years from now. There are 2 authority website, 2 Wikipedia articles, one of which is about one of the authority websites; and Google News in the SERPs. The chances of you ranking for that keyword with your website's current state are slim to nil. Instead, you would have a much better shot at ranking for the keyword "paste text", although even that keyword would prove difficult to rank for with your website (although the chances are much better than ranking for "paste"). I just checked the seo competition and i see a useless site sitting there on the first page with very few links for the specified keyword so i guess you might just get lucky provided that your on page and off page seo is perfect but then its going to be difficult with a fresh domain. The owner created a VK account for the site (it appears that the owner is Russian, as some of the posts are also in Russian). I suspect that the owner has more backlinks for that site than we can see. I dont think he does. The onsite of the page looks amazing for which i guess he is able to rank .He would rather spend money on ASO than SEO . The keyword "paste " is not really competitive as it sounds and also It has an average monthly search of only 49,000 . 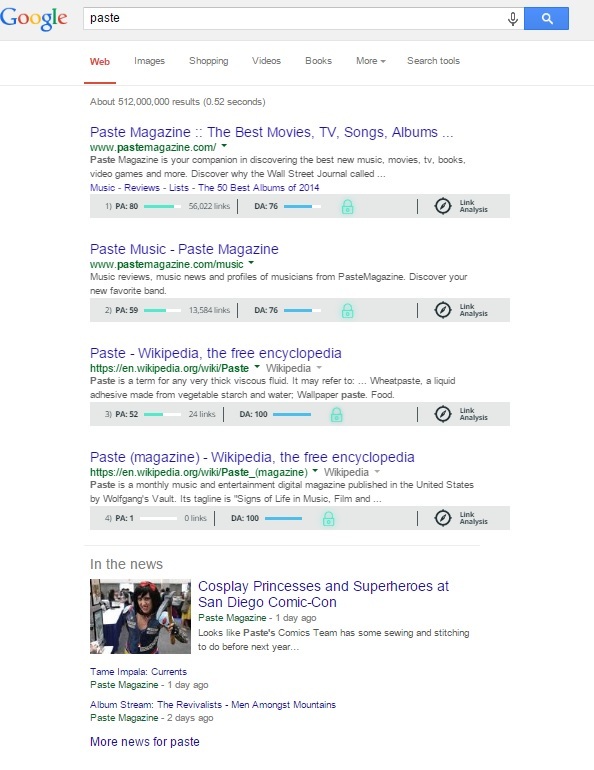 Ranking for "paste" would get you a lot of not so targeted traffic anyways. I'd rather have 10 ultra targeted visitors than 1000 non targeted visitors that are gonna blow my bounce rate to hell. Just look at at all the meanings of paste. Your gonna get kids looking for something to eat or who knows what. More defined keywords will get better traffic and better return all around. "paste text".... Is this ok? Agreed. The site reminds me a lot of pastebin so try to figure out how people find them and slowly leech off their traffic. Even if you ranked #1 for paste, I don't believe you would get more than 50-100 visitors who stay on your site for more than 60 seconds. Its really not that simple. You would need to build links, have good content, social, and a lot more. Just browse this forum and you would find a LOT of really helpful information. This is going to likely take you MANY months or years to achieve even if you are real good at SEO. And even then #1 for a one word term like that will be impossible given comp. Find a lot of longtails that equal out to give you the traffic you want and build landing pages for each. People really search for this word 'paste'?! Reminds me of the time when I was an SEO newb and tried to rank for the keyword 'acne'. Those were the days! I had zero SEO knowledge at the time though and you sound like you know what you're doing so you might as well stick with it. One word keywords are pretty darn difficult to rank for though. thats gonna cost you an arm and leg!